Tuesday afternoon when I realized I didn't have to go to the store til later, I thought it would be a good time to get back into some sort of exercise routine. I brought out my Wii Fit, which by the way, reminds you how many days it's been since you last made a visit. Thanks! What I said to myself while working out ~ Way to go! Keep up the good work! Work through the pain! If you get back in shape, you want have to complain to the doctor again. What I meant to say (especially after I was done) ~ Dumbass! There was no need to jump back into that full force. Working through the pain will probably result in more pain later. And I can't tell you just how true that is! Steps are NOT my friend right now! And if my knee doesn't quit giving out on me, I just might have to cave and call. Ok, enough pity party. Moving on to some funny stuff! GG has a crocheted dragon and a monkey. I didn't make them - they're probably from a craft fair or something. But I did think I was capable enough to make my own versions of those critters. If you click on 'handmade" up there in my nav. bar, you can see the red dragon I made. Anywho, I made the monkeys ~ one for each of them. What I said ~ They were a lot easier than I thought! I'm so glad you like them. What I meant ~ Seriously? You like those? They're ugly as sin!!! to the collection up there in the nav. bar! Tuesday night for dinner we decided to have breakfast food. Now that I have my Foreman Griddle, things go much faster. I can make pancakes (6 at a time) and sausage well before C has the eggs done! Anyways, we all ate an insane amount of food. I won't give exact numbers, but trust me when I say it was a lot of food for 4 people, 2 of which are little. After dinner the kids and I made apple cake. It took an hour to bake so in the meantime I blogged played on Facebook gave the kids baths. Then the cake had to cool so I ran to the liquor convenient store and stopped to put gas in the car. When I got back the 3 of us each had a piece of cake. What I said ~ Holy crap this stuff is good! What I meant ~ Self, you are a complete moron! Do you not remember all those pancakes you stuffed in your face like an hour ago?!? Your stomach is NOT going to be happy with you in about 15 minutes when it sinks in that you ate again! Add that to your knee pains. Maybe you should have stopped at the liquor store so you can pass out and not have to deal with the misery that you will feel later. Good luck lady! I love breakfast for supper! we had that last night! Well, the monkey is cute in an ugly sort of way. Apple Cake? You were setting yourself up! But I totally feel ya...how is it that I can eat monstrous amounts of food and then wonder why I'm not losing weight? I'll buy one off you for my dog! she will love it! yeah, i don't think i would snuggle with the monkey, but it is totally something my kids would attach too and then i would attempt to hide only for them to find it every dang time! Mmmmmm..... brinner! I know what we're having tomorrow! Ok I am so about to date myself here BUT I remember those monkeys from when I was a kid only they stuffed them with old nylon hose and I LOVED mine cause tehy were a whole lot longer then that one.. they sat up on their own and woud hang around your neck.. yeah i am dating myself lol.. I am sure my daughter would LOVE your monkey, she loves odd things like that!!! But then she thinks she is a dog!!! Breakfasts dinners are so wonderful! Working out - not so much! I think the monkey's kinda cute...but I'd go for a brown one. Breakfast for dinner is my FAVORITE!! And apple cake? There's always room for apple cake...wait, maybe that's supposed to be jell-o? If all you people don't stop talking about food while I'm trying to diet, I'm gonna go postal!!! I've been trying to ease into working out too...I'm so out of shape it's not funny! lol!! we have breakfast for dinner all the time and I always feel incredibly guilty afterward! haha!! 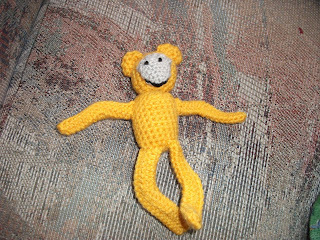 Ohhh, I love the yellow monkey. uh-oh...the boys just saw it. They each want one too! Glad you got your workout in with all the dinner and cake!!! LOL! I recently got a wii and now I want the wii fit. I love to workout and probably go a little overboard with it! I started exercising again too and my knees are not happy. The monkey isn't that bad. Maybe in a different color?